"Rav Boruch Ber demonstrated that it means that one’s mind isn’t at leisure to see or to understand anything besides the Rashba! The mind is shut off to anything else and can take nothing else in. Yet the heart still grasps that there is a young boy here with a serious problem. The heart responds in its own way even while the mind, which is absorbed elsewhere can’t grasp what the pain is about and what the problem is. The heart still understands its own language and can arouse tears." When we speak about what Chassidus accomplished some of us may have a hard time pointing to something in particular. Often times we read about the great geonim of di Lita and we wonder what was amiss in their life that the Heiliger Baal Shem Tov had to come along and revolt against the establishment - which is what he did. We read about the great Ahavas Yisroel that Yidden like the Chofetz Chaim, Reb Chaim and Reb Boruch Ber had and we scratch our heads. What was so terrible about how they lived and treated the simple folk? The simple folk were just about the same, with or without Chassidus. They said the same tehillim and basically conducted themselves very much alike one another, so what did the Besht do that raised the standing of the Ish Poshut? Maybe, just maybe, this story can cast some light unto this mystery. The Alter Rebbe taught us that a cry of a Yid takes precedence, and that such a Mitzvah must not be passed on to another Yid, especially if the other man is also Osek BaTorah. As promised; here's the Nigun "Ezkeroh" as sung in Modzitz last year on the mechaber - Reb Yisroel's - yohrtzeit. I think what gets many of us is that in real life guys like Chaim Dovid, Avi Shafran and some others are really great, warm people. They really do like to help their fellow Jews. It's just that once they start working for the organization/corporation they became hacks. I've had the pleasure of spendingh time with R' Chaim Dovid and he's a gem of a guy. A varemer Galicianer Yid. A ben torah. Many, many mayles. It's tough being around guys like these and stay true to the mission. I also have heard people tell me how Avi was this "wild" guy back in his Kerem days, and even later, in his days in Providence, where he did have to be more straight-laced, he still was a ton of fun. Yet, once you go to work for "daas torah" something happens to you, at least that's the face you show the world. It ain't easy. I'm not sure any of us would have passed that nisayon. There was a Yid in Crown Heights named Reb Shamshon Charitinov. He passed away last night, on the YomHoledes/Yohrtzeit of the Mitteler Rebbe. I was actually his neighbor for several years, but I don't think I ever said more than "ah gut morgen" to him. I had other such neighbors, elderly chassidim; I should've mustered the courage to speak to these Yidden. Reb Shamshon did not merit to have what you can call an easy life. His father - Reb Sholem - died when he was a young bachur, he grew up under Soviet rule living with constant mesiras nefesh, and - I assume make the long journey to Uzbekistan during the War. After arriving in New York after WW2 RSC worked very hard for his daily bread. You may have never heard of him were it not for the Neginah that he produced, rather sang, from his ancestors, some of the most beautiful neginah ever composed, IIMSSM. Neginah that takes you from the mundane on a cold and rainy Monday morning and scrubs your soul clean with tears of loving Tshuveh. Quite literally. If you are not or were not inspired by his singing then you need to examine yourself very closely, because a man with soul NEEDS to be inspired by something as G-dly as that. If he isn't then his "receptacles" may not be working at full capacity. In Crown Heights today the eynikel Reb Sholem Charitinov is one of Chabad's true gems. A durchgeveikte chassidishe yid whose home is always open to any and all visitors, "Sholem" is where many a bocher got his first Shabbos in Crown Heights with the Rebbe. I too benefited from their hospitality, as well as my kids. The one thing he may not have yarshened is the singing voice, but he makes up for it in his hafotzas HaChassides among a cross spectrum of Jews. The same goes for his choshuv'e Rebbetzin, who puts many a chassidisher yungerman to shame with her broad knowledge. They both would be terribly embarrassed if they knew I was speaking about them here, but I feel it's necessary. The world must know of such gems, of the kiddush hashem that they perpetuate with their good deeds. That's part of what we do here at the Tent; we try and be mekadesh shem hashem to those who may not know about G-d. I believe I've been somewhat successful here, despite all the attacks. May Reb Shamshon be a maylitz yosher for all of us, and may we hear his sweet melodies, yachad im kol bnei mishpachas Charitonov LeDoroseyhem, b'vias Moshiach Tzidkeinu Taikef U'Miyad Mamesh! "Vus Macht Mein Zihn?" Azoi vi der Tatte! And that’s how we, The People of the Heimishe Nation, were inoculated with the truism “kids do as their parents." So, to put it in simple terms; if you're a good, law abiding Jew then your kids will be too. If you aren't then your kids won't be either. Hey, Come to think of it, if we would go to some Hypnotist to regress our Heimishe truisms to their source, I’m afraid most of our beliefs would have a very noticeable odor to them - namely, chlorine and caffeine, if you get my drift … Getting back to the point; "Hey, sir, wait one minute! 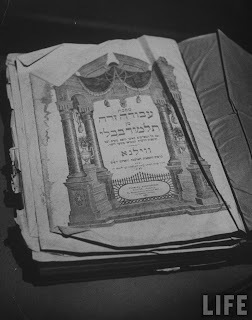 Yankel does follow the books, so then why are his kids "azoi?" Ach! Hust nisht git Farshtanen! By the "chinuch derushes" we were taught that "doing it right" is just not enough these days Not only must you do the right thing, you must ALSO do it with ENTHUSIASM. So the new rule is that if YOU get excited about learning, Shabbos, and davening then your kid will too. But if you don't then your kid won't either. Yuh, s’iz a shvere gulles. So, after all the flyers, pamphlets in the mail , free Chinuch CD’s from Shomer Shabbos Shul in Boro Park, and perforated kvitlach forms to the Gedolim from Kupat Ha’Ir were donated before Pesach - for ten dollars a pound - to the at-risk bocher who sits all day on the Yellow Sheimos Truck; After ourselves and all explanations were exhausted we finally get to hear THE SOLUTION. (We'll talk about the solution in part II, IY"H) They tell us "Nisturim darchei Hashem," we don’t understand Hashem's ways. 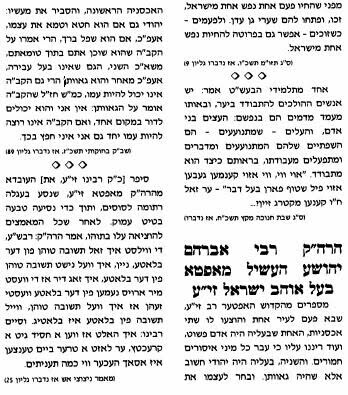 We are reminded that the question how the "tzadik veRa lo" gets such a bad chelek in this world is the oldest one in the book and is the basis for Emuneh etc. And who can forget the explanation that the "trerin fin di mameh by lecht benchin" will never go to waste and are stored in this really big cup in himmel. Oy, and I forgot about the Teffilah for good kids you say Erev Rosh Chodesh Sivan. So, my friends; the Agudath Israel of America's 87th "Yisrael asher B'cha Espa'er" convention is around the corner. ALL the "kenners" are gonna be there. Maybe, just maybe, someone can launch a brand new initiative. Now I know what your’e thinking; there are no more names for projects available, all combinations of all chinuch sounding names are already in use. Have no fear Chaveirim, this project can be called "The Last Clarion Call," bought with permission from the Holocaust Education Foundation, or maybe can even be called “Project Launch.” It will be in Conjunction with The Torah Umesorah Convention Resource Center and in tandem with Project Yes, and a joint project of the Operation Am Echad - Chizuk "Solidarity with our Brethren in Eretz Yisrael Mission." And I’ll even tell you the most opportune time To Launch Project Launch - right before the Chocolate Mousse a’ la la, and in between the Glatt Yoshor round table Symposium. Pleeease! Let project Launch Put together the Guide for Ketanim to Gedolim Manual. Klal Yisrael is in dire need. And when it’s done, would someone be so kind as to drop me a linel on The Complete Idiots Guide to Rising Your Kids Heimish. This must be about the sixth letter I have written since my arrival. I hope you do not expect me to continue at this rate. It is only in the first few weeks that one has so much to write. At the present moment I am not thinking of changing to another Yeshivah. Since my arrival I have seen many and spoken to several people. The fact remains that a Yeshivah with every maaleh does not exist. The Chazon Ish said there was no reason why I should not learn here and even the Gerer Rebbe did not raise any objections. He has in fact several Chasidim with the full attachments learning here. The food, though different here from England, is quite reasonable. At the moment I am managing without the milk since it contains avkas cholev [milk powder] as the Chazon Ish is only matir in case of illness L"O.. ... 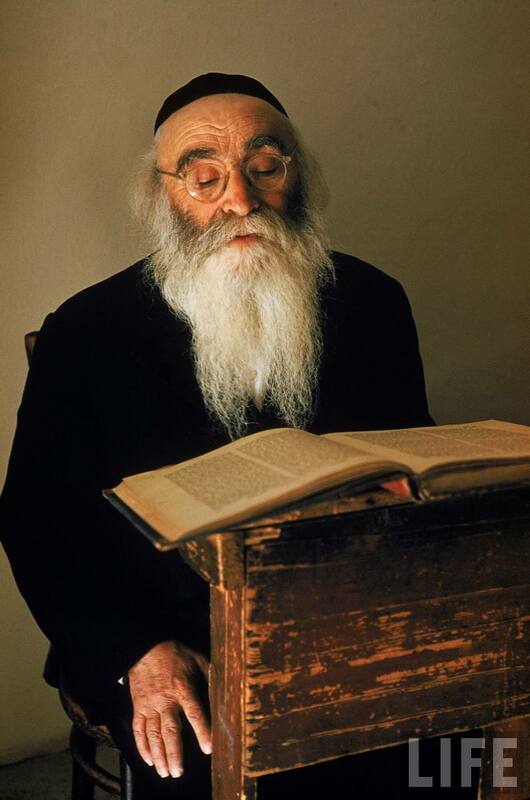 In the Mir [Yeshivah], as I had previously heard, the crowd is more heimish but as they are mostly married the attendance is poor and there is difficulty in obtaining a chaver. Here I have made provisional arrangements to learn Zevochim with a good bochur next zman. Yesterday I went to see the Tchebiner Rov [R' DovBerish Weidenfeld]. He asked me where I came from and my name. When I said Manchester and Reich he immediately asked me if my name was Elozor! It is either Ruach Hakodesh or another possibility I can think of. I asked him a few shaalos all of which he answered immediately. He then asked me if I knew a few of his Talmidim, e.g. R' Avrohom Rand [my Rebbe in Staines Yeshivah], and abruptly wished me KV"T, which doubtlessly meant that the interview was at an end. The Yeshivah here has an exceptionally large library which is only open a few hours a day and quite a few people come in to use it. Amongst them is one regular whom if I had not seen and heard myself I could never have believed. He is not a big Lamdan but is reputed to be the biggest Boki in all of Eretz Yisroel, in fact in the world. Without the slightest trace of guzma, I have seen it myself. You can ask him how many machlokes R' Yochanan and Resh Lokish there are in Yerushalmi Maasros and he will give you the answer without the slightest hesitation. The same applies to all Bavli and Yerushalmi, all the Rishonim and all the popular Achronim such as the Nosay Kelim of the Shulchan Aruch and the Nesivos, Ktzos, Tumim, Minchas Chinuch, Or Someach etc. For fun I asked him to tell me all the Machlokes of the Tshuvos Chemdas Shlomo and R’ Akiva Eger. I had to listen for a quarter of an hour whilst he reckoned them out. This is not an exaggeration; it is unbelievable until one sees it. As he does nothing but learn and has no official position he is a pauper. Such Yieden one meets in Yerusholayim! So this clip is making the rounds and it's getting all kinds of responses. They range from "di Rebbe vert alt," to "s'iz hechere inyonim," to "it's OCD," and worse. I guess it depends on whether you care for the Tosher Rebbe, any Rebbes, or have a thing for shulchan aruch and such. The regular Toshers say that this has always been the case with the TR, that it has nothing to do with age or forgetfulness. They'll tell how the TR would fast every day till late at night because he would prepare himself all day to daven and he would drink only a cup of mehrensaft and chicken soup. That - I guess - is supposed to tell us that everything he does is LaShem LeVado, and we dare not question it. Don't get me wrong; I have no qualms with the TR, I'm just trying to bring out a point. We sometimes overlook things - if we have no issue with the party involved. Most people could care less what the TR does in his room in Boisbriand. It has zero affect on their daily lives. The truth is that there were probably many more of the old Tzaddikim that would have similar Hanhoges, I'm not sure they would repeat Hashem's name in a brochoh like that, but surely there were other problematic customs, like saying "Tatte zieser" during Shmone Esrei, and similar things. Other non-Chassidic Rabbonim like the Brisker Rov also get a "pass" from the masses when we talk about repeating words in Krias Shma, and even using jargon if he wasn't comfortable with the way the Hebrew word came out... It's only those that we so dislike, who we're afraid of, who have an affect on the Jewish People, that we scrutinize with our kelbene seychel and come up with the convoluted opinions that we do. We look at his tefillin and count the millimeters that it passed the top of the head. We watch the clock and we count the minutes past the zman tefilloh it is, and most of all we're very concerned where he sleeps on Sukkos. Why? because we feel like it, and there ain't nobody that can stop us. 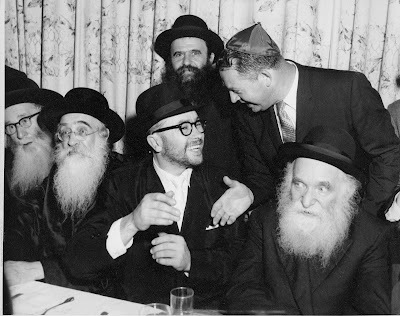 At the wedding of Rabbi Yakov Yosef Twersky of the Chotiner shul in the Bronx, 1961: [RYYT married the daughter of the Kopycznycer Rebbe, Reb Avrohom Yeshua Heschel, zt"l. ] (L-R) The Bluzhever Rebbe, Reb Yisroel Spira; The Boyaner Rebbe, Reb Mordche Shlome Friedman; The chosson, Rav Aron Kotler, Rosh Yeshivas "Eitz Chaim" in Kleck and BMG in Lakewood. RYYT was the son of the Azarnitz-Chotiner Rebbe, Reb Mordche Yisroel Twerski HYD, and led the Chotiner Congregation in the Bronx until his passing in 1991. He may have been a talmid at BMG, I do not know, which would explain RAK's presence at the wedding, or maybe it was his relationship with the KR that brought him there. The Boyaner Rebbe was a cousin to the Kopycznycer, and later his mechutan, when his son Reb Zushe's daughter married the Boyaner's grandson, Nochum Dov Breier, the present Boyaner Rebbe in Yerushalayim. The Bluzhever Rebbe was a fellow member of the MGT of the AI. 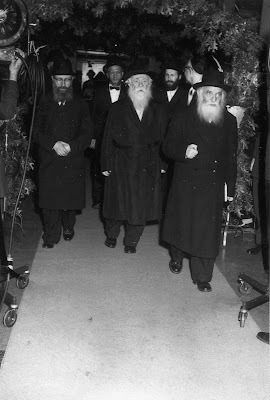 Behind them with the black beard is the Boyaner Rebbe's gabbai, Katz. 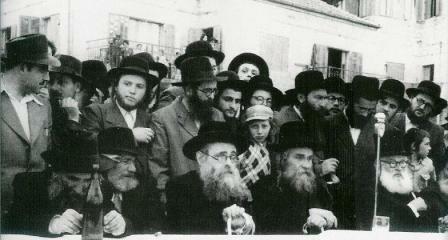 The second photo finds the two again at a chupah, with an unidentified third gentleman at the KR's right. [ aderaba, if you know who it is let us know, as well as who any of the others in the photo may be.] RAK, with his fist clenched and sefer in hand, seems engrossed in a sugya, as he surely was. Click on the photos for amazing detail and clarity. You feel like you're right there with the Gedolim, watching them as they walk down the aisle. Today is Reb Aron's Sislovitcher's yohrtzeit, and to show you fellas how impartial and open-minded I broke the bank and posted these pictures, so that my YESHIVISHE brethren can have a little geshmak too. Other sites give you nothing but watermarked tiny rehashed pictures, we give you quality, large and clear pictures that let you be mekayem והיו עיניך to the fullest and beHidur. That's right, kids, your man Hirshel Tzig is always on the lookout for you, helping you do what's right and just, and always with a smile and free of charge. Don't you ever forget that, even when you think you see me being disrespectful to certain luminaries, it's all a figment of your imagination. Exhibit 3 was sent to us by a good friend of the blog. What we have here is a Datshe somehwere in di Lita, maybe Druskenik, where bachurim, Roshei Yeshiva and Baalei batim mixed freely and basked in the glory of the great men of their day. Today the hierarchy is afraid that the hameyn am will see that they're human, so they're whisked away to far-away Switzerland or Florida, and are kept away from the oylem. Then they had nothing to hide. 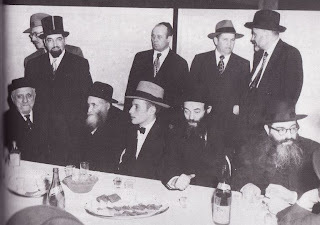 Here the Klecker Rosh Yeshive is talking to among others his cousin from Vaboylnik, [who has his back to the camera] who married his cousin, the niece of Reb Isser Zalman Meltzer. 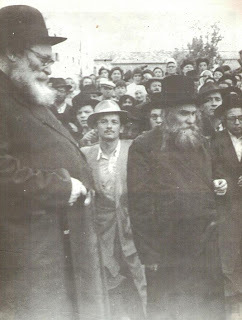 Lebben zei shteyen Bnei HaYeshiva, eppes a BaaliBos mit a kurtze sirtuk un a heyche yarmulke, and also what looks to be a local goy (left) with the mustache next to RLS. They may have taken a break from learning and are about to head back into town. Maybe the goy is a Baalegoleh who's negotiating a fair price. I hope you enjoyed the pictures and the break I took from the heavy, political writing you've had from me these last few weeks. I'd love to hear your opinions on the pictures. "On the blogosphere, many fervently Orthodox Jews were rallying to Rubashkin’s defense — and criticizing Jewish organizations for not doing more to help him. 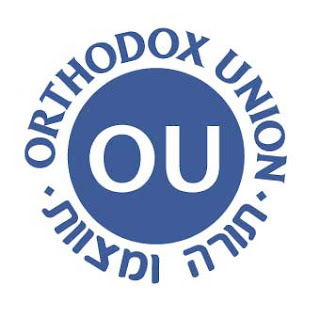 Herschel Tzig, a blogger who describes his “Circus Tent” site’s purpose as providing “a counter opinion to the Chabad bashing that is so prevalent in the blogosphere,” posted a critique of the Orthodox Union for not coming to Rubashkin’s aid, although he did not state what the organizations should have done. 1) I DID mention what they could've done. I asked that they come and testify on his behalf, just like the KAJ did. That isn't too much to ask, now is it? Mass murderers have character witnesses come and testify on their behalf, so why not Sholom? 2) My name is Hirshel, not Herschel. Browsing some of the galleries of the kinus Hashluchim gala banquet I saw many familiar, unexciting faces, but some of them jumped off the page! Like the two here. The first one is Rabbi Yankel Bleich, Chief Rabbi of Kiev and the Ukraine, who was a guest of his brother Moishe, seated next to him, as was the case last year. 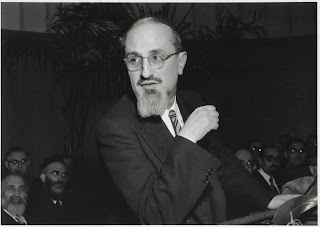 Moishe is my landsman, and maybe yours too if you grew up in Boro Park, and is today what you'd call a successful shliach himself in the feminist utopia of Wellesley, Massachusetts. Not exactly where his Stoliner principal expected him to be now, but nice, nevertheless. I think this cooperation - where Lubavitch brings people from the outside, and not just financial backers ("layleaders") - is a big step in the right direction, where all groups respect and work with each other. The 3rd man in the picture is R' Levi Gorelik, son of Reb Gershon Mendel of Milan. RLG is a son-in-law of the Rebbe's mazkir Reb Binyomin Klein, and is a top mashgiach for the OK and a known lecturer in Crown Heights and abroad. ( I hear now that he's no longer associated with the OK, and that he's involved with the RCE/Merkaz Rabbonei Europa I'm not sure if the three know each other or were just placed at the same table. The next picture is what really surprised me, especially since the all-important Agudah convention is only a week away, when Reb Abish Brodt, pictured here on the left, is the feature entertainer, bringing Reb Chaim Dovid, Esq., into a frenzy on Motzoei Shabbos at Melava Malka. With him are (L-R) Meir Eichler of Eichler's in Flatbush, Lipa Brennan, who organizes the kinus but is the Administrator at Yeshivas Novominsk and the NR's right hand man, and Yerachmiel Benjaminson, Chief knakker at Tzivos Hashem and the Jewish Children's Museum. I would imagine that AB was the guest of either ME or LB, but I'm not sure where YB comes in here. Maybe he too was just a tablemate here. Why either one of them chose AB as their guest is not something I know; maybe one of you can enlighten us. I would think that he - being a staunch supporter of the Agudah and BMG - would not be very fond of Lubavitch, but I could be very wrong. Maybe the times they are a'changin' after all; maybe this is the dawn of a new era of mutual respect and cooperation after all, and maybe Meir Eichler will be prominently displayed in the picture galleries of this year's convention on Thanksgiving Weekend! Even though I have not yet got a permanent place here in the Yeshivah, as accommodation is very short, I have nevertheless got a bit used to the place and have started to learn. This is far more difficult than at the start of a normal Yeshiva Zman as there are so many things to get used to. Firstly, the food and then the people. It is true that a great proportion of the bochurim are of a modern type here, but that matters far less than I expected. The reason is that it is not like Gateshead or in Staines [Yeshivos where I had previously learned] where each bochur was on the best of terms with each other. Here the Yeshivah tends to segregate several groups who, though amongst themselves are very friendly, have very little to do with the others. Most of the bochurim here have never even spoken to half the Yeshivah. There is an olam of Chassidishe who tend to keep together. I shall IY"H write more about it when I have been here longer. On Friday night I went to the Gerer Tish which is not far from here. It was an interesting experience. Both before and after the Tish the Rebbe marches up and down and across the room. Even though it is densely crowded a path is formed and he looks who is there and every now and then says something to one of his Chassidim. As I had already been to see him he recognized me and shouted "Ver hot dich du aher geshlept". After the Tish I went together with [R' Mordechai Yosef] Kamionka and a few others to his house. He served us with tea and talked to us for about one and a half hours. He was very interested to hear about you and all Manchester, especially his Chasidim there. He told us some Torah and a story about a bochur from Chevron who thought of a Torah to a Schverer Rambam in a cinema and had the Mesiras Nefesh to go out and check it up. He is very interested in British politics and is not lacking in general knowledge. He also gave me a few thumps and smacks and pulled my hat off to see if I had a chupik, but I am told that this is nothing extraordinary. It gets dark here at quarter to eight, and at six on Shabbos afternoon I went to Belz. This is on the other side of Yerusholayim and takes three quarters of an hour to walk. I arrived a quarter hour before Kiddush and as I was a visitor and brought the Gabbai regards from his brother in Manchester I was allotted a good place. 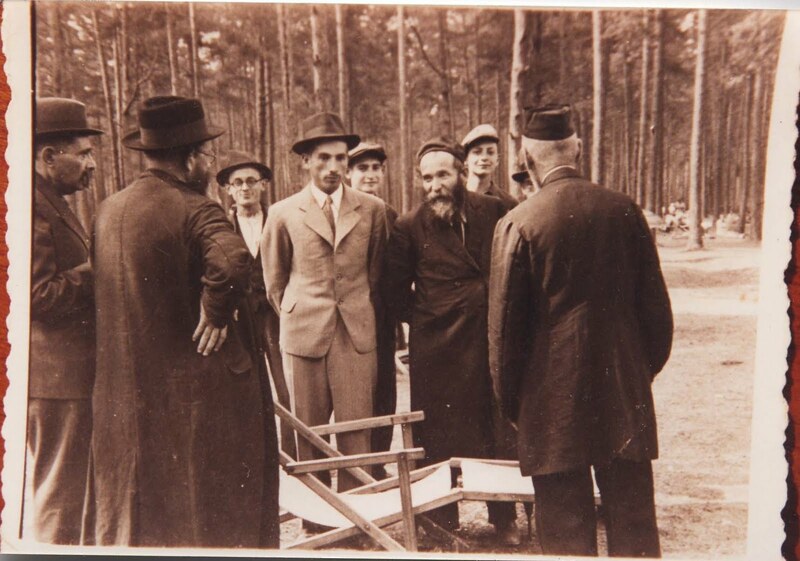 The Rebbe, who looks very weak and can hardly see, is carried in on a chair. He is covered with an enormous coat and never looks up, so it it difficult to get a proper glimpse of him. But the hispaalus of being so near to such a Tzaddik is tremendous. The Tish here is quite quite different from Ger. There is a complete lack of ceremony. There is a Moitze then Shirayim, fish, Shirayim, soup ditto, and so on. After every now and then the Rebbe is carried [out] and there is a pause which lasts from five minutes to a few hours. Fortunately, the ones when I was there were nearer the former. After the Moitze it was beginning to get dark so they davened Mincha and then there was a pause before the fish. With several pauses it was about 9 (well after dark) when the first Seudah was finished. 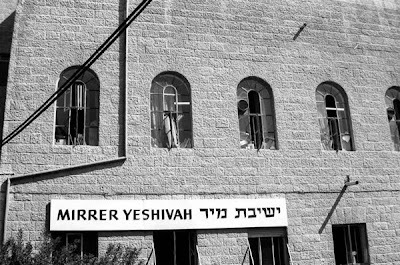 I had intended staying for Seudah Shlishis which was due to start any time and finish about midnight and would then have had a small chance to go in to see the Rebbe, but the pushing which was incessant had tired me and I took the bus back. Next time I intended taking the bus after Shabbos and arriving for Seudah Shlishis. I must say that even though I found he Gerer tish more interesting and lebedik (in Belz they just daven the Zemiros, and you know how they daven in Belz). Nevertheless the Belzer Tish was for me more impressive. I have met many people who I know from England here including Luria, Yochanan Twersky, Steinhaus, who sends regards to Duvy, and various Meshulochim. Last week there was strike in Ponovez Yeshiva on account of the food. The bochurim won and the position there regarding food is now satisfactory. 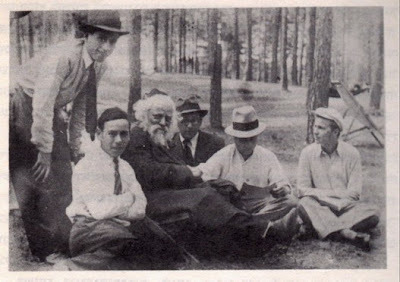 I intend going to Bnei Brak tomorrow to see the Chazon Ish with a certain friend of mine and I intend on visiting the Yeshivos there at the same time. I have just received your first letter. A letter from home now has now a far greater Chashivus from such a distance. I have digested the contents. I do not intend to do any sightseeing (except for visits to various eminent Jews on the Sabbath) until Bein Hazmanim. Please write all letters now to Chevron Yeshivah, where I am staying now. I have been to the Roshei Yeshivos to say Torah and they seem satisfied. I see myself that a Chassidishe Yeshivah is impossible due to previous objections. Today I heard a Mussar Shmues from the Mirrer Mashgiach [R' Yechezkel Levenstein] who is one of the Tzadikei Hador. Every chosid here admits to that. Afterward I had a talk to him. He is such a nice person. He knew all about my coming to EY and invited me to learn in Mir. If there is anywhere else where I go to learn in Yerusholayim it will be there. The davening there is a mechaye. But the trouble is that the attendance there is very poor. 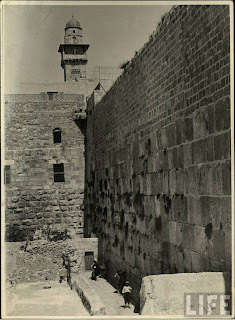 In the evening the Beis Hamedrash is nearly empty and it is very difficult to find a Chaver there. The News about Rubashkin obviously hit very hard. Just a bit harder in Lubavitch than elsewhere. That's not to say that most other Jews weren't shocked and pained by it. Although the mah yofis'nikkes were having a party... The idea that bank fraud can put a man away for possibly the rest of his life while mass murderers - think 9-11 detainees - may walk free and have Government appointed lawyers and advocacy groups, speaks volumes about the situation in these United States today - as far as frum Jews are concerned. Even some people who I thought had a gefiel for another Yid shocked me with recent comments, where they all of a sudden have a new respect in the "law." They see no problem with the fact that he may never see his kids again outside the prison walls.The only limud zechus you can have on such people is that their own lives are so miserable that they look desperately to kick the proverbial horse while down, no matter who he is and how long he must suffer. To their credit - despite having terminated their relationship some years ago - the KAJ's Rav HaMachshir (and Rov of the Gerrer shtiebel in Flatbush) Rav Chaim Cohen did come and testify last week on behalf of Sholem Mordche. The big chachomim here will immediately respond with "a lot of good it did him," but that's totally beside the point. The point is showing solidarity. Your concern is not to make cheshbones of how much good it'll do. Kudos to Reb Chaim for that. We can ask where Rav Weissmandl was, and that would be a valid question, but we can agree that he's basically small potatoes, doesn't speak the language very well, and would not be a great help. But the big question is WHERE WAS THE ORTHODOX UNION IN ALL OF THIS? WHY WERE THEY NOWHERE TO BE FOUND? Why was it OK for them to profit from Rubashkin all this time - despite pressure from the MO/Conservadox community to remove the Hekhsher - yet not have one nice word to say about him when he needed it most?! Just when we thought that Jews were coming around, that they finally realized what's important for us as a nation, reality hits. You see the archaic opinions, the petty infighting, and very often they come from the enlightened ones, the "dina demalchusa" crowd, the same ones that thought Casper Weinberger was the reincarnation of Hitler when he locked up Pollard all of a sudden have full faith in Sioux Falls' most loyal civic servants. What does this tell us about our future generations, about the upcoming crop of "leaders?" It's times like these that you realize that this is not what the eibishter wants, that you're not fighting daas teyreh c"v when you speak up about these issues, but rather, you're fighting G-d's fight, you're the little guy speaking up for the big guy in the sky himself. That's what separates me from the heretics in the blogosphere, despite the fact that we often go after the same cast of characters. The heretics go after the "leaders" because they see them as part of what G-d wants, with me and some others it's the opposite. We see them as impostors, having no relation to G-d or his commandments, and we want them to stop claiming to represent the Torah way of life. Watch the Kinus Hashluchim banquet Live! UPDATE Tuesday: Video player removed. It seems like some of the older browsers were having trouble loading the blog due to the video player here. ITRI. It's not as flashy a name as Ponovezh, Slabodka or Mir, but most of you know it, have at least heard of it, or may even have learned there or know someone who did. It seems like ITRI is not what it used to be anymore, Machlokes has ripped that place asunder, and a very small group of boys learn there now. 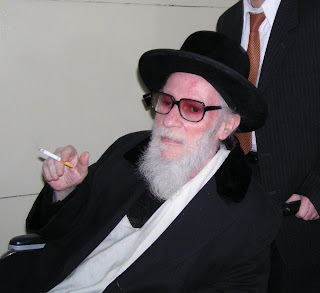 Last week the Rosh Yeshiva, Reb Mordche Elefant, passed away, dealing another blow to the Institute. let me preface all this by saying that I know very little about him and the Yeshiva. The observations I'm making are based on what I've seen on forums and what I heard from people this week. 1) He had the Brisker Rov's (yesh lomar Reb Chaim's) kesovim and boasted about it to everybody that would listen. That means that the Rov never actually gave it to him, he got his hands on it somehow. Sounds to me like a Chassidishe Geneiveh. If he publicized them and let the world learn from it, then Tovoy olov brochoh. Why should the Solovejczyks just hold onto it like it's the most precious thing in the world, and that only they're allowed to see it or learn from it? Many of the kesovim in Chabad today are only available because of Chassidishe Geneivos - geneivos of chassidishe kesovim & chafeytzim. I never understood why one had to shlep to Bene Beraq and knock on the door, begging to buy a set of Kehillas Yaakov. What about bittul Teyreh? what about Kovid haTeyreh of Benei Teyreh? It must've been the chassidisher opshtam; "never trust a gevorener," they always say... Who do they think they are, bringing in all their chassidishe shtick into our communities? The beards and the peyos and the getting married early, and all the other chumros?! This isn't Hornosteipel, ya hear? we did things differently back in the old country! 2) He was the only one who wouldn't walk out backwards when leaving RYH's presence. This was mentioned on another blog without mentioning RYH, for some reason. I think he has some kind of beef with Chaim Berlin and its personnel. Here is another case of copying everything he saw happening in Lubavitch. Why the need to follow others if he was so original? We may never know the answer. RME said that he didn't do it for RAK, so he won't do it for RYH, which is cute, using RAK to belittle RYH. At least for me, it is. Take one look at the picture and you see that even when confined to a wheelchair he took nothing from nobody. You might say he was the last of the independent Litvaks; he did what he wanted to and marched to his own beat. The glasses, the scarf, the velvet on the collar and the cigarette remind you of a bygone era, when bosses ruled the big cities. 3) Zaydie Herman didn't like him at all. RME was a son-in-law of Nochum Dovid, brother to Racoma and Bessie Herman. The only frum people in the Lower East Side, they would have you believe. At least that's the way the book makes it sound. So Zaydie was very frum, so much so that he made life for his poor kids absolutely miserable, and he didn't like what he saw in young ME, no matter what kind of gutte kop he had. You might say s'hut em nit dershmekt. He had a good nose, the old Litvak. I'm not sure what it was he didn't like; maybe he was a little too smooth for him. Not that RPS was any less smooth looking back in the day, but it's hard to tell just from pictures. 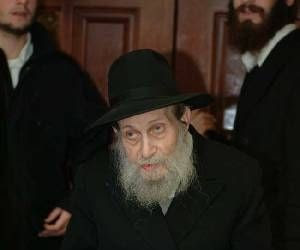 Why, even Reb Leib looks like a Flatbush Baal HaBuss in the picture, and we all know he wasn't one. Which is interesting, because in America most of the old Europeans changed their Levushim to a more respected hat and frock. But maybe this was still before Reb Leib got married. Maybe one of you can help me out here. The wedding picture was in 1951, was he married yet? Reb Mordche was seemingly unique in our days that he never got the memo that all Litvishe Gedolim were also Kedoshim Merechem Imom. We know that chassidim believed this to be the case, but in the Olam Hayeshivos diLita this was never the case. So if you came to RME and told him where you're learning or where you learned in the past, he would let go with all the Loshen HoRah he knew about the Rosh Yeshivos. While a mature young man can maybe handle that expose on his Rosh Yeshiva, a 17-year old may find his world caving in after spending some time with him... My customary obligatory double-standard cry would be that he was best buddies with all kinds of irreligious politicians and members of the Israeli elite, but with him it was OK. Not only was it OK, but it was cute and cool. Yet the Rebbe got attacked by the very same zealots for accepting SHaZaR and other such politicians and for giving Hakofes to anti-dati Israeli politicians and such. Reb Mordche nebach had no children and probably died a broken man, seeing how his empire had crumbled these last few years. zol er hobben a lichtigen gan eden. It is now exactly three days since I arrived in Eretz Hakodesh, but it seems much longer. There is so much to write – impressions, people I have seen, events – that I do not know where to start. Well, I think the first thing is the wonderful, thrilling feeling of being in Yerusholayim. To think that in these very streets walked the Acharonim, Rishonim, Amoroim, Tano’im, Anshei Knesses Hagedolah and even the Nevi’im and saw the same deep blue clear sky and the same rocky fields, is alone enough to make it seem worthwhile. But first I shall confine myself to the continuation of my previous letter. I arrived in the Yeshivah here on Tuesday afternoon and saw several friends including [Rav] Eli Sternbuch [now Rosh Beis Din in Antwerp], who have helped me a lot. There is a great shortage of rooms in the Yeshivah but they have many nearby, and I may have to sleep in one of those. Meanwhile, nothing is settled and I just have a temporary vacant bed. Chevron is just as I imagined it, no better and no worse. Whether I shall be satisfied here it is far to early to judge, but I shall certainly be satisfied that I came. The food is alright, except that it is quite bewildering to get used to being Mafrish Trumos and Maasros, worrying about Shemittoh and Orloh, which are both extensive problems here. But I shall write more about the Yeshivah later. The afternoon when I arrived there was a massive demonstration against Giyos Bonos as that was the day of the final reading [of the Knesset Act] when it was passed. I did not realize how deeply it affects the people here until I saw a crowd of several thousand people saying Tehillim. In the evening I went round to Meah Shearim, which is near the Yeshivah. Full description later. 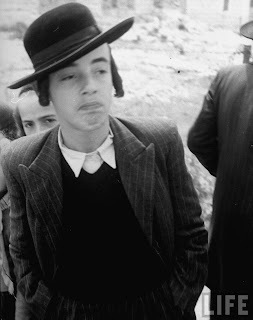 On Wednesday I went to see S. [Rebbetzen Yaakov Arieli, ne Sternbuch] and her husband – a charming young man. ..... On Wednesday evening I went into the Gerer Rebbe [R' Yisroel] to say Shulem. There was a queue and I had to wait three quarters of an hour to get in. However, it was well worth it. I had a talk with him for twenty minutes in which he cross examined me about everything. How am I related to the Rottenbergs, the Sternbuchs? Who wears sheitels [in Manchester]? All details about my journey, cost, route, etc. Every now and then he gives a shout "Ich Her Nisht" and altogether shouts a lot at one, but I was forewarned about that. He also said in English, "Do you spik English?" and was interested in the rate of exchange I got and a lot more. He then gave me a brochoh after the exhaustive and exhausting inquiry. Thursday evening I went to Feter Yossel’s [Reb Yosef Halpern – a Manchester-based uncle] sister’s house and also met their father [ R' Shmuel Halpern – the first Moro D’asro of Zichron Meir] who is staying there at the moment. ... Of course they are very interested in the news from England. I also heard on the radio there is a recording of the Knesset debate about Giyus Bonos. Now that it has become law a Shul in Meah Shearim said Kinos last night with all the Tisha B’Av accessories. אמר הציג: Notice how not many in Manchester wore sheitlach back in the day; we can see from the question that not many did. The same could be said for London outside Stamford Hill - that means you guys in Golders Green - or anywhere outside of New York for that matter. Ask your parents or grandparents if they lived out of town in the 50s or 60s and see them smile. Notice how the BY needed to know everything about him, his family and his trip. But most of all I was surprised by how the English bachur didn't think giyus banos was such a big deal! He needed large groups of people to say tehillim to see that. He's fascinated by the fact that they take everything so seriously there, even going as far as saying kinos and all. 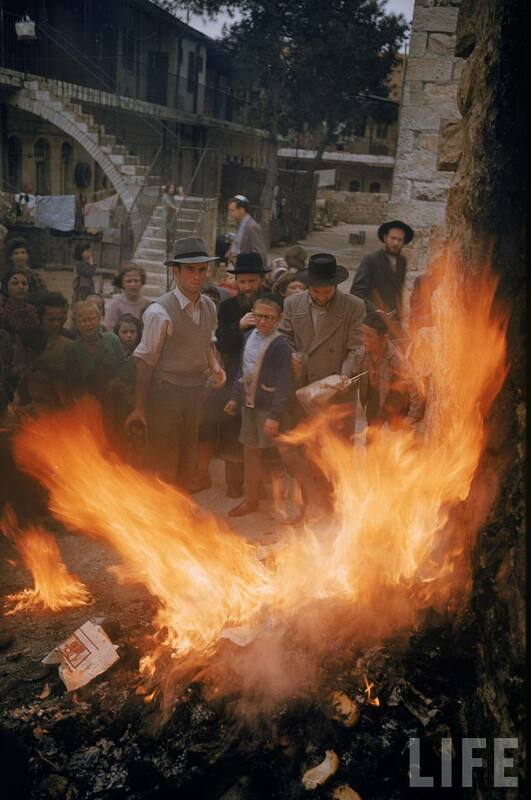 Which goes to show you how different even frum Jews were at that time. I dare say that had this happened in the US there would be no outcry, no cries of yeherog veAl yaavor, and no mass protests. Call me an insensitive Lubavitcher freyak, but you know I'm right. No Jew in America would rock the proverbial boat in 1953 and go out en masse against the Government. They were happy to be here and have refrigerators and wall-to-wall carpet. Bimechilas kevodo of the Rav; he had a Romantic and nostalgic view of Chassidus in Poland. Things were not as feigeldik as he decribes it. But the Rav was a darshan a master of homiletic, and as any good darshan and magid, you create an atmosphere imagined or real to prove your point. In Nefesh Horav, Rav Hershel Schacter has the Rav saying that good part of his droshes are theatrics, and of course thats true. See "Boston Boy" by Hentoff for a most interesting portrayal of the Rav as a preacher. 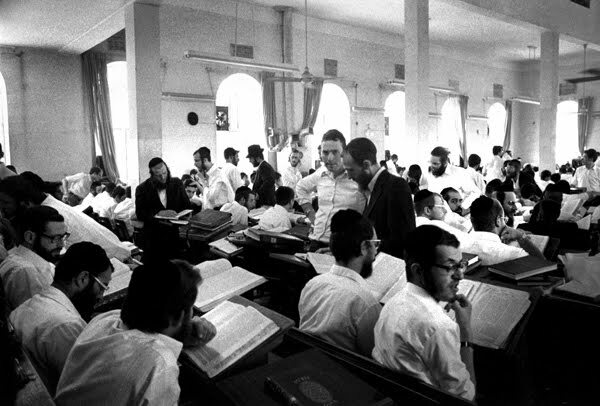 Thousands of Chassidic young people were leaving the fold every year to become secular Jews, Zionists, Communists etc. The big Chassidic groups were not particularly spiritual, that's why Rebbes like the Piasecner, Reb Shimmele Zelichover, the Levertever, the Koznitzer and Chabad were gaining followers from the young people. Even those who stayed Chassidic joined groups like Zeirei Aguda and Poalei Aguda where politics was more important than other activities. See Mendel Piekasz's fine study of this subject in Hebrew, where he studies the state of Chassidus in Poland between the wars in depth. Rabbi Simon Huberband alludes to these issues in his book about religious life in the warsaw Ghetto. Many Chassidim were not particularly learned either. That's another myth; as if the water carrier in Warsaw knew shas and the Vilner water carrier was a lamdan. Nonsense. Punkt farkert! until after the War you could be a good Orthodox Jew and not have anything beyond a cheder education. Today 99% of chassidim have attended yeshiva gedola and Kollel. Of course the pockets of chassiduth that did exist, were much more powerful than what passes as chassidus today. As I mentioned, you had spiritual Rebbes in Poland who were slowly rebuilding chassidus, like the Piasetzner and Levertever . You also had chavrayas studying Chabad, a network of shtieblech adhering to the teachings of Rav Kuk, and men like Reb Hillel Zeitlin HaY"d. But in general today's chassidim are much more learned in Gefes, if not in darchei hachassidus, And I presume the Rebbes of yore were more serious people. But let's not mince words, the Rav was wrong - Chassidus and chassidim have reconstituted themselves in the USA. Let me add a controversial idea , I believe the last Lubavitcher Rebbe agreed with the Rav on this , and that's why he changed Chabad from a movement that stressed Avoda and "Haskolah" to a movement stressing pragmatic action. When the Hungarian and Galitzianer Chassidim started coming for dollars, I am convinced the Rebbe was a bit amazed that chassidus had grown in America with the classic levush, Yiddish, and the whole 9 yards, a lot of which had been left on the wayside by Chabad in America. Sure he saw some Chagas people in CH in the early 1960's but there was a tremendous shvachkayt there, Bobov in 1960 was not Bobov in 1980. But these groups were huge and more Chassidic by the 1970's and no longer in CH. I am sure the Rebbe would have been amazed to see life in BP in 1989. 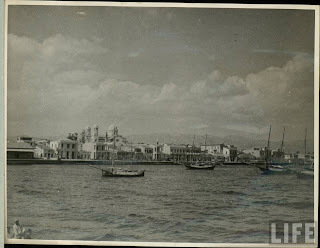 We arrived in Cyprus this afternoon and I went ashore in a small boat as there is no proper harbour in Limasol, the port. It is a very interesting place, 95% ramshackle, old houses and shops and the other 5% would put anything in Upper Park Road to shame. It was boiling hot but we enjoyed walking around and seeing nothing but British cars, merchandise and firms, in fact everything is British. The post boxes are inscribed GR and cars go on the left. One shop has displayed "Representatives of Boots". Everything is amazingly cheap, but I could only get a few shillings of the local currency and had to content myself with apples at 6d per pound and grapes at 4d per pound. The biggest excitement of all will come, of course, tomorrow when at 7a.m. we arrive at Haifa. I am thrilled when I think of it. Yom Daled Yeshivas Chevron, Rehov Hagai Yerushlaim IHK. BEH"Y, Omar Rebbe Yochanan - Kol Hamehalech Daled Amos Be’Eretz Yisroel Muvtach Shehoo Ben Olam Habo. To continue where I left off – we were up very early next morning (Tuesday) and as it became light we got our first glimpse. You can imagine the excitement. The boat docked at Haifa at 7.30 but until all the formalities were completed a lot of time went and I only got off the boat at nine. Meanwhile, by shouting over the side I spoke for a minute to Mr S. (an acquaintance of my grandfather) who had managed to get into the harbour but not on board. He gave me his address and sent regards to Zeide and everyone. Then came the Customs... They opened each and went through it piece by piece. Arguments and arguments. When they discovered the [suiting] material all my protests were of no avail. I went to see the chief and argued again, but it was no use. I had to pay 17 Israeli Pounds. I also had to pay something on the toys and 17 pounds on Shtraamel Shvensen, but I’ll get that back [from the sender]. After finishing with them on leaving the harbour I met SL [a friend from Gateshead learning in Mir] who had come to meet me but had been unable to get into the harbour. He then saw to the matter of arguing with the taxi drivers etc and in another half an hour we were off to Tel Aviv where we changed cars. How wonderful it is to drive across the country seeing orange groves, banana plantations, and the actual wonderful beauty of the countryside. On the road signposts with such familiar names as Bne Braq, Rishon LeTzion helped to convince one that one really is in EY. I don't feel it properly yet, but I suppose and hope it will grow on me. Tel Aviv is Tel Aviv, boiling and nothing else but blocks of flats and shops with little taam. Yiddishkeit is not in great evidence. Half way between T.A. and Yerushlaim we begin climbing the Horay Yehudah. Scars from the [Independence] War are still noticeable. It begins to get somewhat cooler and suddenly were are in Yerushalaim. It does not take long by car to get through. We drove straight to Yeshivas Chevron where I am at the moment. I shall end this letter now and write more later. Write to me at Chevron please. A seemingly innocent blurb caught the Tzig's attention. R Mordechai Gross, Rav of Chanichei HaYeshivos, whatever that means, (which yeshivos?) is gonna be in Montreal for Shabbos. He will be the guest of Mr. Hershey Friedman, proprietor of the new Agri in Postville. Here's how "The Shteeble" described him: "Rav Mordechai Gross, Rov of Chanichei Yeshivos in Bnei Brak and dayan of Sheiris Yisroel is widely recognized as one of the young gedolim of the Israeli olam haYeshivos. We will have the merit of having him spend Shabbos Chayei Sara here in Montreal." We can definitely argue that fact, despite the innocuous description the blogger writes. Who decided who's a young gadol? I dare say that even among the Bnei HaYeshivos HaLitoyioys he's not a "gadol." Why just today I asked a very knowledgeable young man, who veiked zich by countless Rabbonim and Roshei Yeshiva in the Holy Land and he had never heard of RMG. Whatever, that's not the point here. I - not being of the conspiracy theory mindset - find it weird and complex that HF has this relationship with Gross, especially since he pulled Agri out from under the Rubashkins' feet. Rubashkin the Lubavitcher, that is. Obviously Gross had nothing to with this, and I'm not blaming Friedman for Rubashkin's demise, but I could not help myself but wonder about the relationship. Gross' connection to Shearis, which was founded only to counter the Hechsher of Rav Landau is what makes me go hmmm. I doubt most other gevirim in North America have Gross on their Rolodex. The London Jewish Tribune this week started publishing a series of letters I wrote home some 55 years ago from Jerusalem. I flatter myself that they may be of interest to some of my family, friends and acquaintances, who would not normally see the Newspaper.The first article published in the 10 Sep '09 edition is addended below. 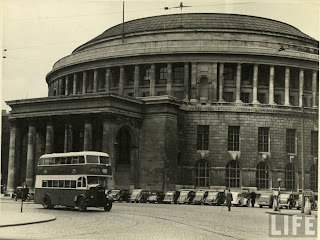 From the London Jewish Tribune: "In August 1953 Elozor Reich, then aged 21 years old, left his comfortable family home in Manchester to learn in the famous Chevron Yeshivah in Yerusholayim, after having earlier learned in Staines and Gateshead Yeshivos. His correspondence with his parents is a veritable historical treasure. The letters are reproduced (with some omissions) as written. Any clarifying additions are in square brackets. " I am now aboard ship and I intend just starting this letter and adding to it later. Since I left Manchester exactly one week ago today I have seen so many people and received so many impressions that it seems like a month already. Well, I think the best thing is to start at the beginning and describe in short my journey so far. The first thing I would like to say is that if you think of coming to EY, do so by air or alternatively as second best, travel first class and only take as much luggage as you can easily carry without assistance. As I do not belong to either category I have had a pretty rough time. It is difficult to describe a worse feeling than being utterly at the mercy of horrible porters. 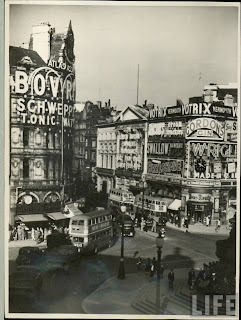 Well to start – when I arrived in London I got my seven pieces to the Left Luggage Office at Liverpool St. Station and went to 121 [Manor Rd, N16] to find [R'] Moshe [Sternbuch] [his sister was married to my brother Yudel] in sole charge. 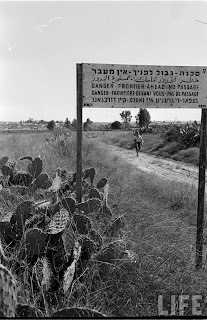 He was controlling a traffic of endless meshulochim and other bearded and clean-shaven Jews. Some came in to sleep and some just to eat sardines from the tin and various other unwashed vegetables. Immediately when I arrived [R'] Moshe pounced on me and led me in and introduced me to all present and invited me to join in and share the sustenance. After that he found me a vacant bed and I managed to get to sleep after digesting a long list of people to whom to give his regards and a lot of general information about Yeshivah life in EY. I boarded the train at Liverpool St [for Harwich] next morning and the trip across to the Hook [of Holland] was very enjoyable. So far so good. On arrival at Holland my troubles started. Since I had no train reservation my plan was to get off the boat first and grab a seat. Wishful thinking. My seven pieces of luggage made all my plans miscarry. Firstly, the was a great paucity of porters portering in this particular port. Secondly, they were all lazy. Thirdly, my luggage was all on the wrong deck. Eventually, I got off the boat about third last and found the platform where stood an immensely long giant train. But after asking three porters, two Cooks’ officials and one interpreter it transpired by majority vote that only one sole carriage was to Italy [where I had to catch my boat]. The rest were to be shed at diverse junctions across Europe; where exactly there was no clear majority. One porter who said the whole train was Rome-bound quickly lost his deposit. The train was due to leave in ten minutes so there was no time for a recount. My porter had deserted me and my seven pieces at the bottom of the platform (that did not prevent another angrily claiming the Union rate). The only thing to do was to get into the carriage marked Ventimiglia. Now, besides the normal people for their wagon there were a whole crowd like myself who had been diverted from France, so it was a rugby scrum. Three quarters of the seats were reserved and the odd quarter was taken long before I approached the battlefield. The only thing was to get on somehow. Having had some practice at various tishen I picked up the heaviest case, held it like a bayonet and charged. This operation I repeated several times and beyond being near a state of collapse, I was O.K. 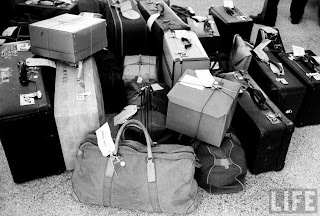 My seven luggage pieces were littered at intervals along the corridor and I found myself in a vice between a Scottish priest and an aristocratic Italian student who could talk any language you can think of in less than ten seconds and knew everything about anything. Compared to us sardines in a tin were as far apart as the Poles. It was absolutely unimaginable. So started the journey across the Continent at 6.40 p.m. Monday. I was right at the back and at every second station officials would enter. Their entry necessitated lifting out a whole pile of luggage and a few bodies. At a frontier, and we crossed three, each time before and after, four officials would bother us, one to examine passports and ask questions, another to stamp them, a third to dish out forms asking silly questions and the fourth just stam a nosy parker. Not understanding Dutch and Italian and pretending not to understand German saved some bother. I did not get any sleep at all, firstly because of the oppressive conditions we were in and secondly because of the above officials and ticket collectors of whom there is a plethora right across Europe. We arrived in Basel early in the morning and relief came. They tagged some coaches on and half the people got off. From then on I had a seat but the magnificent Swiss scenery, which I beheld for the first time, kept me awake. At 3 p.m. Tuesday we arrive in Milan over an hour late in broiling sun. There was no porter in sight and so again out with seven pieces on to the platform. After resting several minutes I hunted out a porter and managed to get him to understand that I wanted the stuff in the Left Luggage Office. This accomplished I mastered the intricacies of a strange telephone system and got through to Jose T [son of an Milan family, friends of my parents]. He immediately came round, showed me where to have a bath, took me to the flat where I met Mr & Mrs T, and where I had a bite. After that we went to see the shipping company, who treat you quite decently if you speak English and were informed that I would still have to register in Genoa. J. then showed me the sights of Milan including the smart shops and a brand new Bays Haknesses which looks like an opera house. After oversleeping the night in a hotel it was a big rush to catch the 7.35 a.m. train for Genoa. On getting there, again trouble with the porters (never will I take so much luggage again). I took a taxi to the port. There was not much bother there, just the formalities of the ticket and the Customs. The ship immediately looked rotten and so it proved. A cabin shared with fifteen others, no chairs, towels, air or room. There is only a small space of deck allotted to the third class and deck chairs cost 4/- [shillings]for the journey and every time you want your paid-for chair you have to eject someone. The food situation is not so bad but rather monotonous. I am living on hard-boiled eggs, tomatoes, tinned salmon and sardines, and bread. So far the sea has been smooth and we have had only pleasant weather. Immediately on boarding I looked round for Shoimray Shabbos etc. and found two; a Melamed and a very old Bochur from Venezuela going to join relatives. On Thursday we arrive in Naples and I joined a tour by bus. We saw Vesuvius and celebrated the ruins of Pompeii. It was very expensive but well worth it....... On returning I found two Bachurim from New York who were going to the Belzer Yeshiva and had boarded. This was already their third week at sea. Friday night there was a whole to-do about a Minyan. One Mechalel Shabbos who liked the Bretel scraped together a Minyan. Of course, the Belzer boys did not want to join in and there was a row. Shabbos afternoon we docked in Greece, Ve'Iyanti Besforim VeRo'isi SheMutar Loredes Min Hasphinoh, but the trouble was one had to carry a [reboarding permit] paper. I tried to avoid this but failed ignominiously and so had to stay on board. Today is Sunday. We arrive tomorrow in Cyprus where I hope to go ashore and Tuesday Be'Ezer Hashem Nizkeh Laylach BoEretz SheAfilu Moshe Lo Zochoh Laylach Bo. On the boat there is a mixture of British, Americans (mostly 1st class), French, Italians, Greeks and Cypriots. There are also a few Sabras Mumrim LeHachis RCH"L . Never have I met Shekutzim as low. I have made friends with a few English people including one from Manchester! I spend the time learning, sunbathing, playing chess and talking to various people. Taking everything into consideration the ship journey could have been far worse. Well, I shall leave off here until later. Is VosIzNeias bought and paid for? !